In 2004, a farm pig in China weighed almost a full ton at 1984 lbs. Its owner, XU Changjin, a farmer of Wafangdian city China, said the pig had only reached the age of 5 before it passed on in 2004. A professor by the name of Liu Mingyu, said the pig had reached such a large size that it was too big to move around normally and died from general lack of exercise. 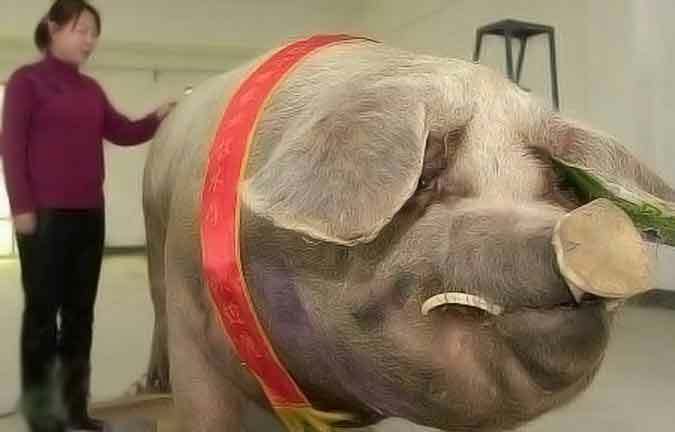 XU Changjin had the pig stuffed and Liu made the pig ready to be exhibited in the Liaoning Provincial Agricultural Museum in China.